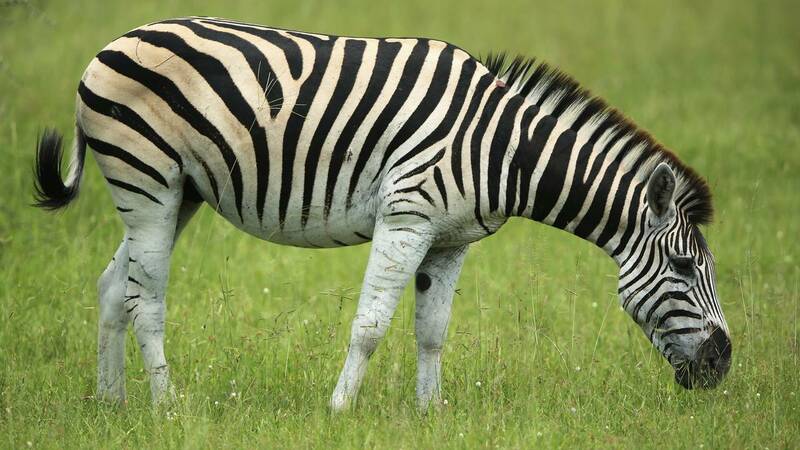 (CNN) - The zebra's stripes are known to protect it from blood-sucking insects, as well as acting as camouflage, and new research suggests that being stripy may also work for people in remote tribal communities who paint their bodies in monochrome shades. The traditional body-paintings of tribespeople in Africa, Australia and Papua New Guinea may offer protection from the blood-sucking horseflies abundant in those areas, the new study says. Publishing their findings Wednesday in the Royal Society Open Science journal, a team of researchers led by scientists from Eotvos Lorand University in Hungary describe a bizarre series of experiments they carried out to test their theory. They coated several plastic mannequins of different colors -- some mimicking dark skin, others in fair tones, while the remainder were dark brown with white stripes -- in glue and left them for four weeks in a horsefly-infested meadow in Hungary. At the end of the experiment, the researchers counted the number of horseflies stuck to the glue and consistently found the fewest on the striped models, followed by the fairer-skinned ones then the darker tones. The darker-skinned models attracted 10 times as many as the striped model. The fairer-skinned one attracted double the number of horseflies when compared with the striped one, and the darker models had 5.1 times more flies than the fairer-skinned mannequins. "We show that the attractiveness to horseflies of a dark brown human body model significantly decreases, if it is painted with the white stripes that are used in body paintings," the authors write. "Thus, white-striped bodypaintings, such as those used by African and Australian people, may serve to deter horseflies." The authors add that this could mean less skin irritation and lower transmission of diseases from insect bites. Biting flies can cause injuries but also transmit diseases, study author Susanne Åkesson, a zoology professor at Lund University in Sweden, told CNN in a telephone interview. Åkesson added that the color of our clothes also affects our attractiveness to horseflies and other biting flies. "Do not wear black or dark clothes," she said. "You should have light colors, white or beige." You should also avoid wearing any reflective materials, Åkesson said, as they attract horseflies because they look similar to water, where the insects lay their eggs.